BodyFly™ programs are designed and realized by CST – Technical and Scientific Committee, starting from the original matrix of holistic discipline, taking into account the specific characteristics of the main areas of application – Fitness, Beauty, Spa/Wellness – in which they are activated. BodyFly FITNESS includes a series of programs of “body mediation” where the body is the main instrument of training and awareness. They are directed mainly to the group classes of fitness centers and meet the postural, energetic and of conscious movement parameters conjugated to respiration provided by holistic discipline BodyFly™. BodyFly AIR an exceptional program that uses SwisseBall and Softball in bodyfly to train deep muscles, deputy to the prevention of musculoskeletal injuries and the gaining of major functionality in daily activities. BodyFly BAMBOO used in chinesitherapy to treat and prevent diseases related to musculoskeletal structures, the support of the bamboo in the program bodyfly Bamboo ™ stands as a valuable tool for the correct execution of the synergistic, coordinated and functional movements. BodyFly FLYBOARD is a unique program that uses the proprioceptive and multifunctional “Flyboard”, a tool made of wood and arch-shaped to improve proprioception, balance and postural-tonic system. Made in Italy, it is used without the mat from both the concave and the convex side. BodyFly OVERAGE – Program of functional exercise intended for over60 people to counteract the deficit of self-sufficiency, to preserve and improve the overall physical and mental condition, facilitating social and personal relationships. BodyFly SLIMTONE A body weight loss program aimed at improving cardiovascular activity integrated functional exercises against resistance, whose load is the body weight. Lose weight while maintaining muscle tone. 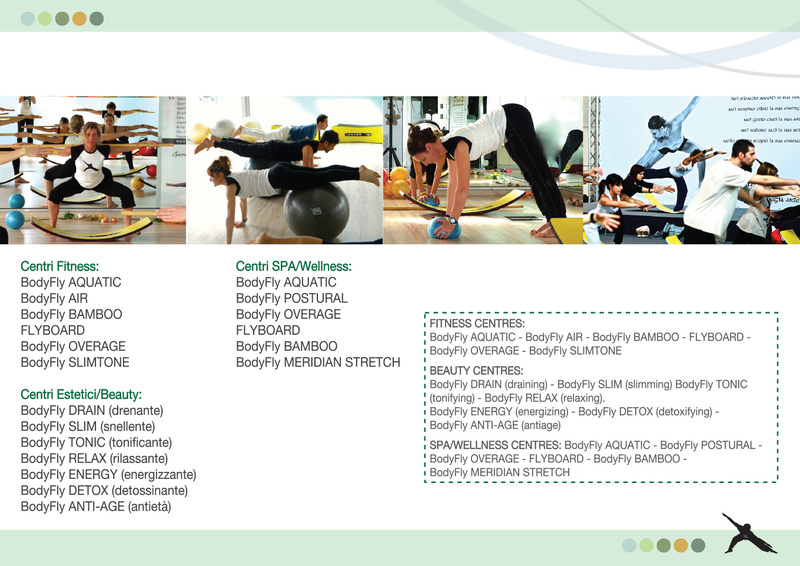 BodyFly AQUATIC – revolutionary program of gym water for a synergistic, functional and postural toning. Outstanding for Fitness, it ‘s very valuable also as a treatment of well-being and sensorial perception in Wellness and SPA facilities. A perfect blend of harmony, movement and energy. 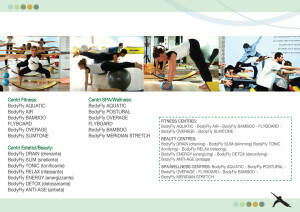 Fill out the form and ask for info to activate the exclusive Bodyfly FITNESS Programs.